I really like this in theory. In fact, in the sun it was gorgeous, I have to admit. But once it's indoors, it's really boring against my skintone. I wanted to try layering combinations, but anything on top will cover and dull the shimmer and golden microglitters. I would love this in a purple shade, does anyone know of anything like it? BONUS PICTURES - With one coat of Sally Hansen Purple Pizzazz! Ooh, it looks great outside. I love it with Purple Pizzazz too! I never would have thought of doing that. I just found a bottle of this but haven't tried it yet. Looks awesome! And I love the idea of layering something over it. 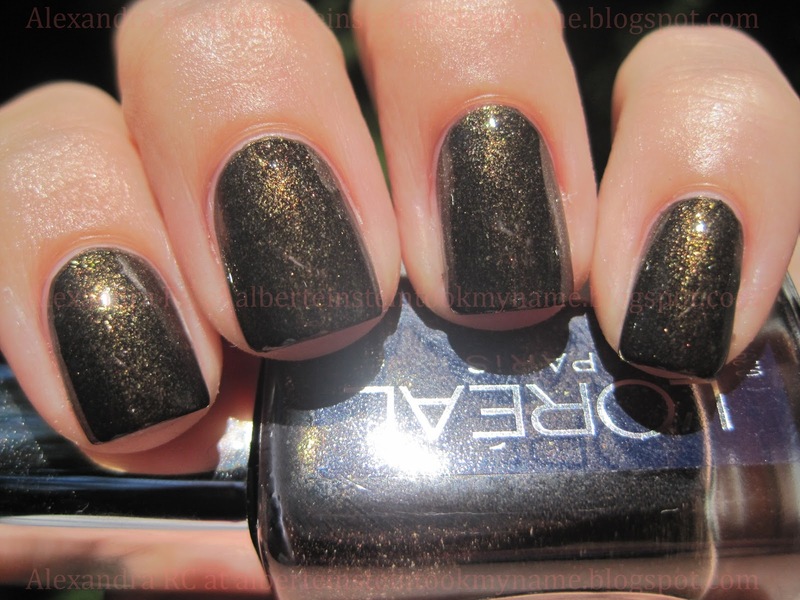 Hmmm...maybe CND Gold Sparkle Effect on top to intensify the gold sparkles? I love it with the purple on top! 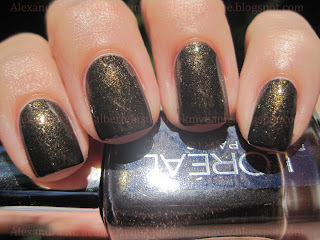 This color seems to be very popular on the blogs! I just don't like it! @ Laura: it's what I'm here for, to give you layering ideas! @ Fingers: it's one of those that grows on you. And also I think maybe it's because it's been a while since L'oreal stepped up with nail polishes?